Motion is both elementary and fleeting; it is a fundamental precondition to our survival and our civilization. Motion is the functional basis to the discovery, measurement and exploration of the world that we live in. Elucidating and calculating motion are central issues within our culture, which is not only based on motion but designs it, being built upon a history of dynamics and acceleration. The Jovis Verlag Gmbh publication Gestalt der Bewegung Figure of Motion is edited by Annett Zinsmeister and was published in July 2011. The book presents Representatives of different disciplines—ranging from architecture to car design, from art-, cultural- and media-studies to sociology—discuss the depiction and design of motion in art, architecture, design, dance, and technology. This overview of historic developments and current trends discloses some surprising, border-crossing correlations. An interesting chapter for example is on ergonomics and the history of making human motion to sync with the rhythm of machine production. Inge Baxmann is discussing the work of Frederick Winslow Taylor who used photography and video to dissect complex working processes in to micro movements and reassemble them to fit better with the machine cycles. This is a very interesting perspective since motion, especially human motion is generally taken given and natural. We simply move the way we move because of some biological constraints. However as Baxmann argues there i a great deal of training and capitalist rationalisation. Of course this would then on a larger scale be similar as to the way we move in cities and urban areas. WHere we are trained to step in sync with he beat of the location. 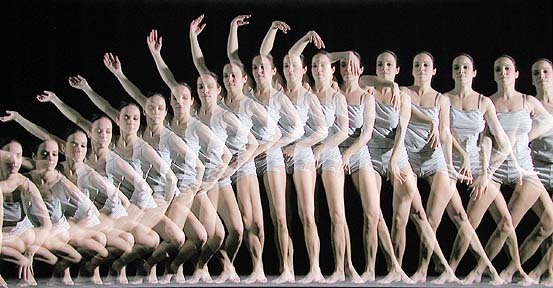 Stroboscopic Photograph of a dancer in motion. The publication includes essay contributions by Inge Baxmann, Margitta Buchert, Söke Dinkla, Christophe Girot, Scott de Lahunta, Claus Pias, Stephan Rammler and Annett Zinsmeister, and interviews with Michael Schumacher and Chris Bangle. For a sample preview of the book see HERE. Image taken from architecturebooks / Figure of Motion book cover. Zinsmeister, A. ed., 2011. Gestalt der Bewegung Figure of Motion Weisenhof., Berlin: Jovis Verlag Gmbh.